Firefighters successfully carried out a controlled burn early Thursday to remove the threat to the Mount Wilson Observatory and nearby broadcast communications tower resulting from the 16-day-old Station Fire. Fire commanders also said that hand crews and bulldozer operators have substantially expanded the encirclement of the arson fire, which is now 71 percent contained, compared to 62 percent Wednesday. Full containment is expected by 6 p.m. Sept. 15. The controlled burn had been postponed for three straight days before an improvement in wind conditions allowed firefighters to carry it out overnight, amid cooler temperatures. "Firefighters burned out vegetation approximately half way between Mount Wilson and Cogswell reservoir in extremely thick vegetation. The burn was successful," the U.S. Forest Service said in a statement this morning. The controlled burn removed brush from areas where anticipated Santa Ana winds could have sparked spot fires, according to the statement. The fire has scorched 160,357 acres -- slightly more than 250 square miles -- since it broke out near a Forest Service ranger station Aug. 26. As of this morning, fighting the largest fire in Los Angeles County history has cost nearly $78 million, said Forest Service spokesman Tom DeBellis said. Around 3,650 firefighters remain assigned to the blaze, which still threatens nearly 4,000 structures, according to fire officials. The east flank of the fire remains uncontrolled, but construction of fire containment lines around the San Gabriel Wilderness Area ``is going well,'' according to the Forest Service statement. Teams plan to work Thursdat day to assess damage caused to homes and businesses affected by the fire, according to a statement from county's Office of Emergency Management. The assessment effort involves personnel from the Small Business Administration, California Emergency Management Agency and the county's Office of Emergency Management, according to the county. Authorities said the fire was sparked by an arsonist near a Forest Service ranger station off Angeles Crest Highway just north of La Canada Flintridge. The state has offered a $100,000 reward for information leading to an arrest and conviction, and the Los Angeles County Board of Supervisors Tuesday authorized a $50,000 reward. No evacuations were in effect Sunday morning. The virtual city that sprung up at the Hansen Dam Recreation Area, where firefighters are staying, remains in place, and thousands of fire personnel from across the state and the region are expected to spend Labor Day on fire lines. A full complement of firefighting aircraft, including SuperScoopers leased from Canada, are standing by if needed. Water- and retardant dropping helicopters and planes were instrumental in keeping the inferno from taking out key broadcast transmitter sites on Mount Wilson, also home to a historic observatory. 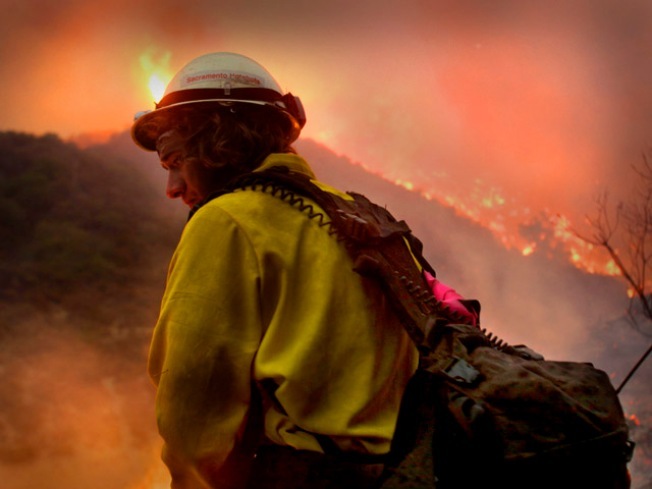 At nearly 155,000 acres, the fire ranks at the largest ever in Los Angeles County. The projected containment date is Sept. 15, but firefighters could get it surrounded a few days before that. The governor has offered at $100,000 reward for information leading to the fire starter. Investigators have said an accelerant was found near the point of origin. Prosecutors could seek homicide charges against the culprit. Los Angeles County fire Capt. Tedmund "Ted" Hall, 47, of San Bernardino County, and firefighter Specialist Arnaldo "Arnie" Quinones, 35, of Palmdale, died about 2:30 p.m. last Sunday when the vehicle plunged some 800 feet over the side of road near a fire camp. Firefighters who have been battling the Station Fire in the Angeles National Forest paused and saluted Friday as the body of Hall, who was killed while fighting the blaze, was driven in a white hearse from North Hollywood to Victorville. With Thursday's announcement that the Station Fire was considered an act of arson, the firefighters' deaths are being investigated as homicides. Thursday's funeral procession began at a North Hollywood fire station and went north on the Hollywood (170) Freeway then moved slowly past Hansen Dam Park, which has served as the command post for crews battling the Station Fire, which has scorched 154,655 acres since it broke out Aug. 26. As the white hearse was driven slowly past, fire crews lined the streets and saluted their fallen comrade. The 123-mile procession stretched from the North Hollywood fire station to a funeral home in Victorville. Hall had been with county fire for 26 years, while Quinones had been with the department for eight years. Hall started his firefighting career as a student in 1981 and had worked out of stations in Lakewood, Whittier, La Puente, La Canada Flintridge, Acton and Palmdale. He is survived by his wife, Katherine, and two sons, Randall, 21, and Steven, 20. Quinones was expecting his first child with his wife Loressa, who is due to deliver in upcoming weeks, according to Capt. Michael Brown. Quinones began working with the department in August 1998, and had worked in Palmdale, Covina and La Canada Flintridge. A public memorial service for both men will be held Sept. 12 at Dodger Stadium. 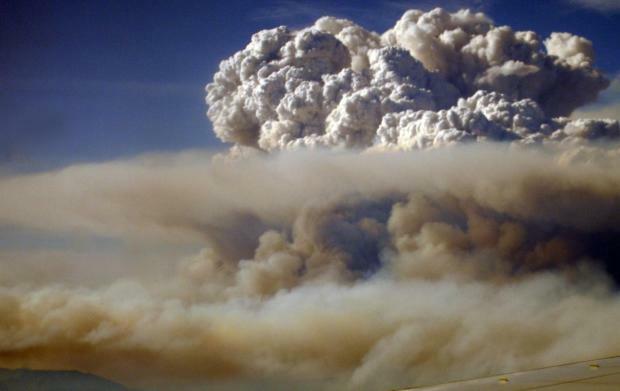 The Station fire entered its thirteenth day Monday, with the blaze 56 percent contained.